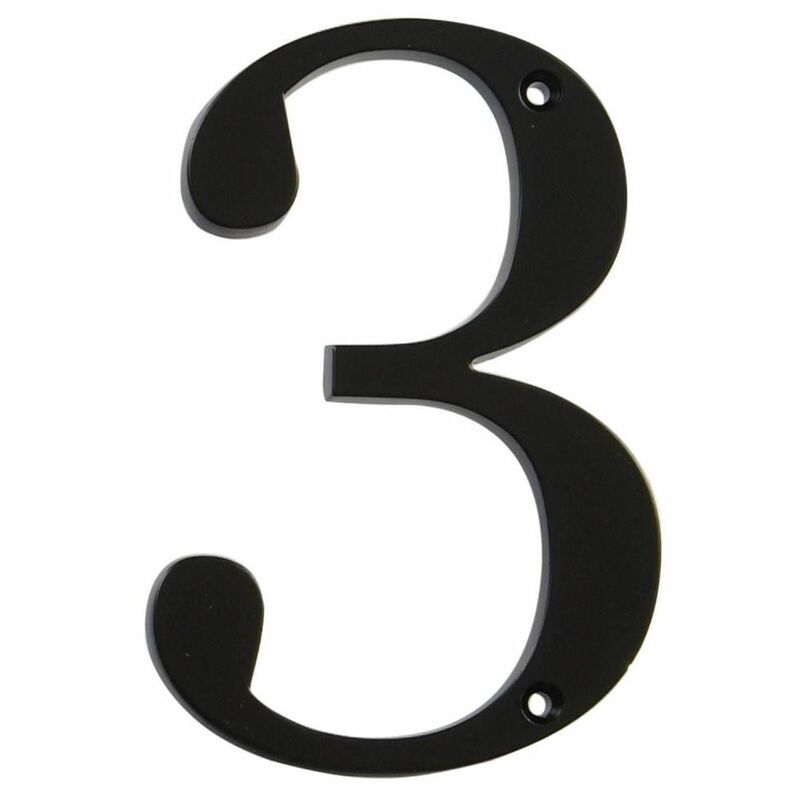 4 Inch Black House Number 3 Accent your house with the Hillman Distinctions line of house numbers. 4 Inch Black House Number 3 is rated 4.0 out of 5 by 4. Rated 5 out of 5 by abc123 from it was a good product. it was a good product. Rated 5 out of 5 by SteveVA from I used this number to make a new house number sign for next to the front door. The previous was 3... I used this number to make a new house number sign for next to the front door. The previous was 3" letters that drivers couldn't see from 50 ft. away in the street. These numbers are big, noticeable and stylish. They have not worn as well and were easy to screw on the board. The hardest part was making sure they were all aligned and level. Rated 4 out of 5 by Mark from get what you pay for These numbers are nice and have decent weight and quality font. For $4 each, I'm not sure what else you want. Yes, the screws are cheap. I didn't have as much trouble as the other reviewer. After drilling pilot holes, I had 1 of 16 screw heads twist off. I just took it back to the store and exchanged it. The screw heads will rust, so hit them with a dab of paint or nail polish after installation. Rated 2 out of 5 by CellarRenovator from Numbers look good, but screws are bad China quality The number is nicely shaped and looks good. However, the black screws that come with it are the cheapest quality I have ever seen. I bought 4 numbers, which included a total of 8 screws (2 each). Out of those eight, the heads of three screws broke off while I attached the numbers. (Using a manual screwdriver, not a machine.) Further, the black coating of the screws is very bad, and started bleeding white after the first rain. Please Home Depot make the product 50 cents more expensive and give me good quality!